Our new salon + spa concept will open this winter! We’re at it again – and this time in the Short North! Our latest salon + spa concept is in a castle – the Castle Property, that is. We’re taking the success we’ve met in Dublin with the opening of our salon in May, and bringing it to the city. Here, urbanites will be able to enjoy not only the services, but the community we plan to create. 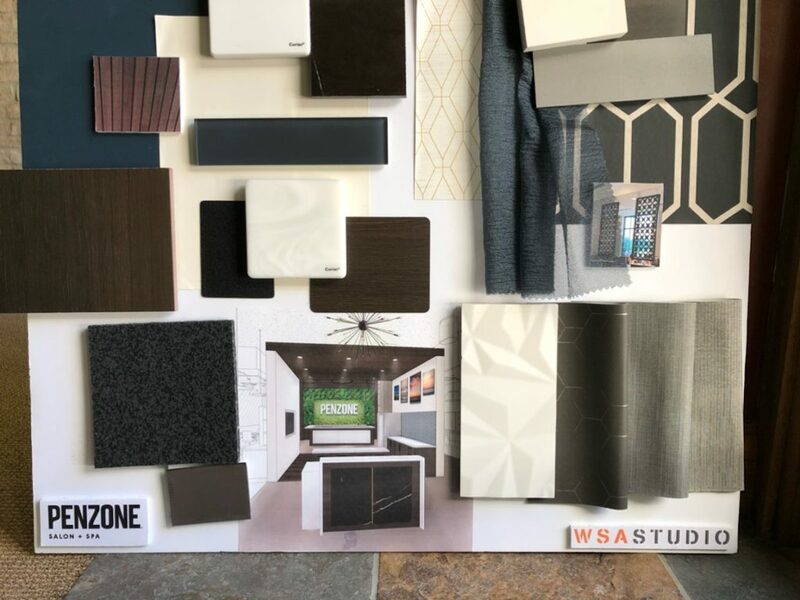 A preview of the finishes at PENZONE Short North. 1. A BIGGER SPACE, DESIGNED TO PENZONE PERFECTION – We’re graduating to a bigger space in the castle. We’ll be adding a few more hair stations to our space, and even more to our spa! We’ll have two multi-purpose spa rooms for skincare and massage, twice as many mani/pedi stations, and our much adored Beauty Zone – right up front! Just like in Dublin, the Beauty Zone is for our results-oriented gal-on-the-go wants to get in and out with amazing looking skin. 2. MORE ACCESSIBILITY – We’re excited to share that you’ll have even more opportunities to get in and see our talented team! YES – on Sundays and Mondays, we’ll be at your service! 3. THE COMMUNITY CONTINUES – If you’ve made it over to Dublin, you’ve quickly picked up on a vibe. We’ve got something special going on there. And we’re excited to bring that energy to the Short North. Our Social Room will be the perfect space to bring our Beauty Labs and Evenings of Enlightenment to you. We’ve also noticed that guests are enjoying our space – even if they don’t have an appointment. WE LOVE THIS! Come in, grab a juice or coffee. Pull up a seat. Do some work! We can’t wait to see our Short North community grow! 4. SIPS + SNACKS – We’re partnering up with our local faves found at Dublin and putting a new twist on them for the Short North. You’ll love the option to grab a latte, cabernet or even a cocktail here. And hungry? No worries. Our healthy snacks will help you power up and feel good about doing it! At PENZONE Salons + Spas, we understand what it means to feel confident. Confidence is more than just beauty – it’s bold, yet timeless; smart, but never condescending. Our artists and therapists are committed to helping you uncover your confidence and live beautifully from the outside in. We’re ready. Short North, are you?